‘How are you’ is the meaning of Sanskrit word ‘Kimbho’, which Patanjali has chosen as the name of its messaging application. Patanjali will relaunch the Kimbho App on August 27, Acharya Balkrishna, the co-founder of Patanjali Yogpeeth Haridwar, has announced. The app will be available on Google Playstore and the iOS App store starting August 27. 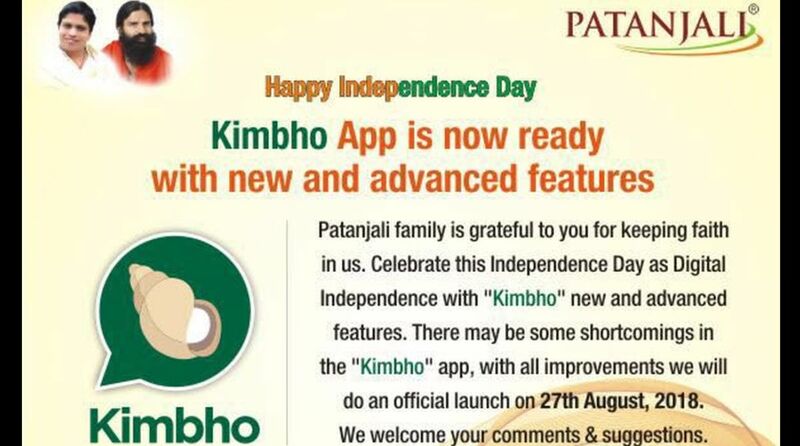 Balkrishna took to Twitter, saying the Kimbho app has been completely revamped with more advanced features. Baba Ramdev’s Patanjali Communications had introduced the swadeshi messaging application in May this year. But, the app had to be removed from Apple’s app store and Google Play store within 24 hours of the launch, allegedly because of some privacy and user data security issues. Acharya Balkrishna also invited people to give feedback and suggestions to further improve the platform and the user experience. Kimbho is being marketed as India’s answer to Facebook-owned messaging app WhatsApp. Just like WhatsApp, Kimbho too allows users to send messages, make voice calls, and also share multimedia files like images, videos, GIFs, and also location. The Kimbho also supports ghost chatting, auto delete messages, wipe out feature, among others.